Hello everyone and happy Friday! 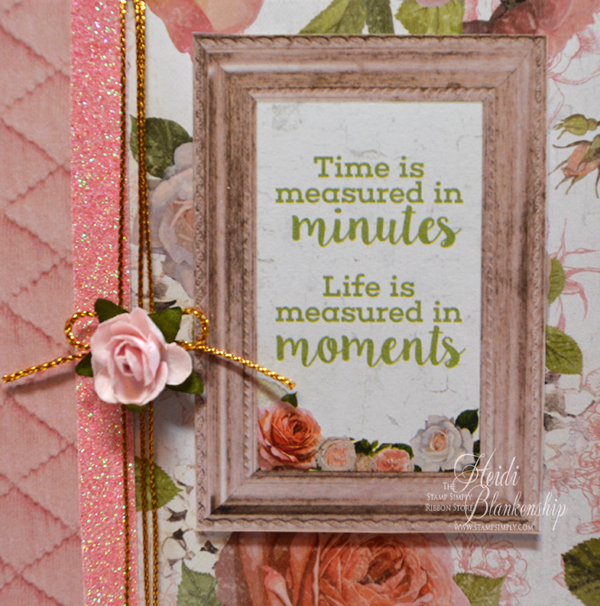 Today, is my day to post for The Stamp Simply Ribbon Store and I have a card to share with you using some of the beautiful Kaisercraft Cottage Rose paper collection. This is a pretty CAS (Clean And Simple) card for me and it came together so quickly. 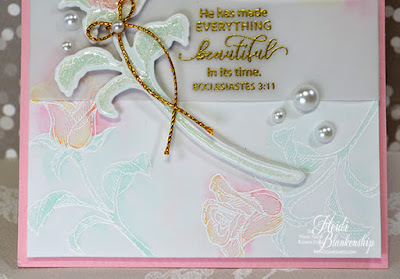 One thing I love about the Kaisercraft paper pads not only do they have gorgeous papers but they also have die cuts and sentiments which makes creating cards very quick and easy. 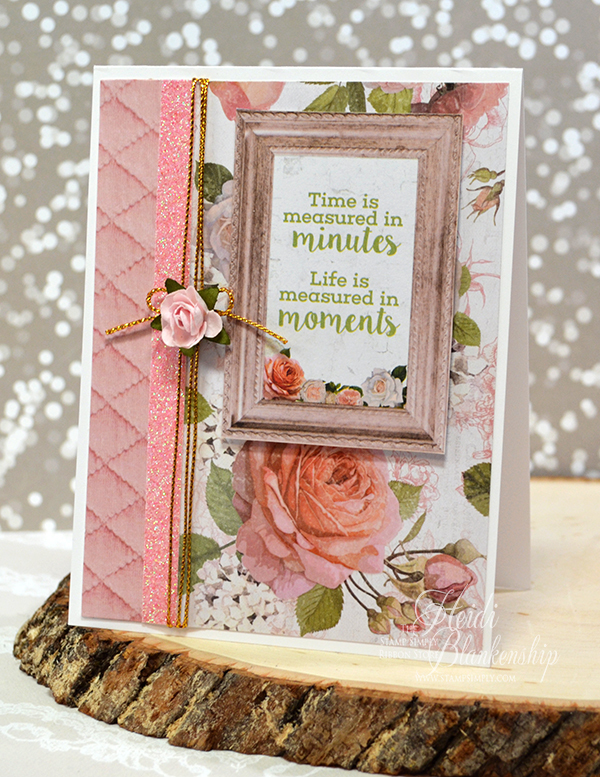 I used a rose floral print and a quilted strip of decorative paper for the background. Then I added a piece of American Crafts Peony Glitter Tape to cover up the seam between the two papers. Next, I wrapped some May Arts Gold Metallic String along the left side of the card and added a Kaisercraft Mini Paper Blooms Fairy Floss, The decorative frame with the sentiment is one of the die cuts in the paper pad. It matches perfectly with the paper. I added a few 3D Foam Squares to the back of the die cut to add some dimension to the card. I attached the card front to a white A2 top folding card base. 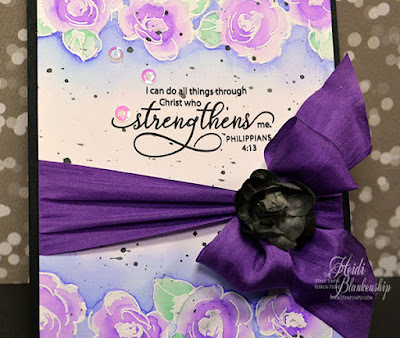 The paper pad is filled with die cut so you would be able to create several CAS cards and then just add a little ribbon, flower or your favorite embellishments. I hope you enjoyed today's card! If you would like to see more card inspiration from the design team check out the Stamp Simply Blog. 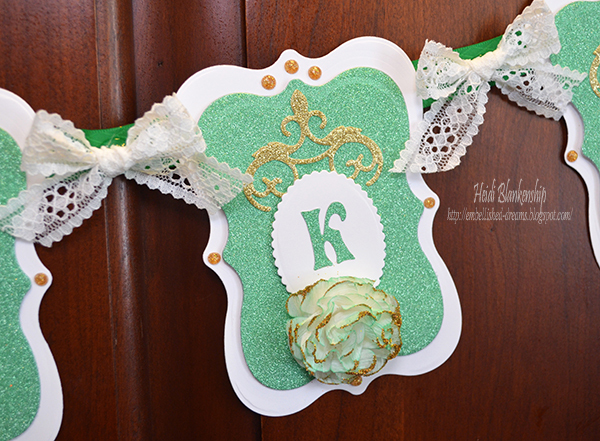 For all of your paper crafting goodies visit The Stamp Simply Ribbon Store. Sharon has a wonderful selections of products. Thank you so much for stopping by today! I hope you all have a wonderful weekend! Hello everyone! 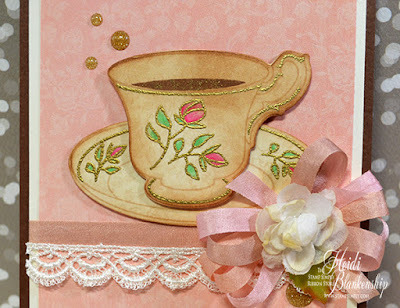 Today, is my day to post for The Stamp Simply Ribbon Store and I am also participating in the 2017 Spring Coffee Lovers Blog Hop. If you would like to participate and check out all of the fantastic cards you can click HERE for all of the details. Here is a look at the card I designed. 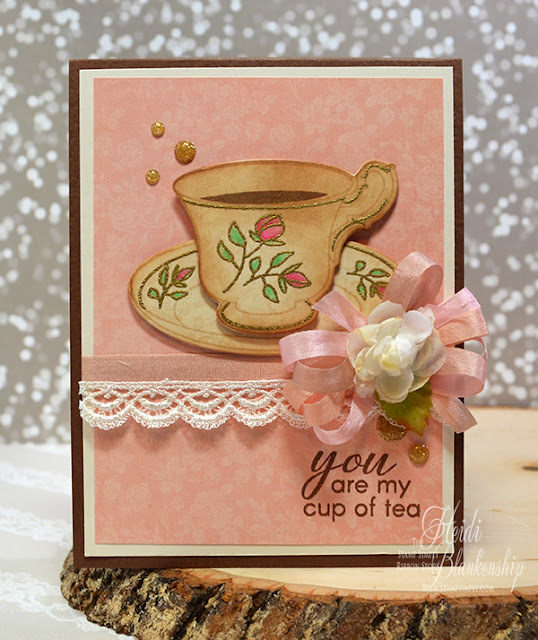 I used some of the beautiful Graphic 45 Mon Amour pattern papers and the Altenew - Vintage Tea Cup clear stamp set. I stamped the image of the tea cup and saucer on to a piece of the pattern paper using the Sand Dunes ink from the Altenew - Coffee Break 4 Ink Cubes. 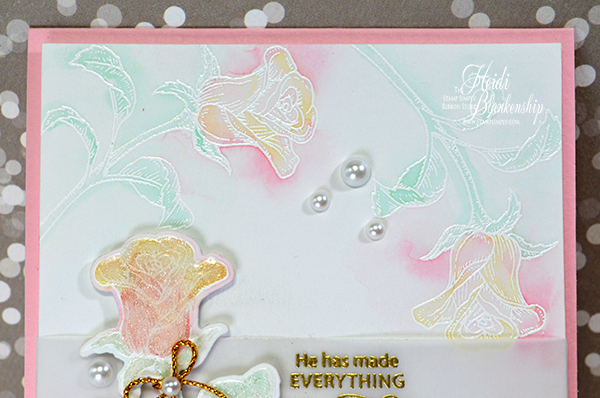 Then I stamped the decorative details and small floral images with VersaMark Ink and heat embossed with Ranger Super Fine Detail Gold Embossing Powder. I used Zig Clean Color Real Brush Pens - Sugared Almond, Peach Pink, and Green Shadow to color the small floral images. 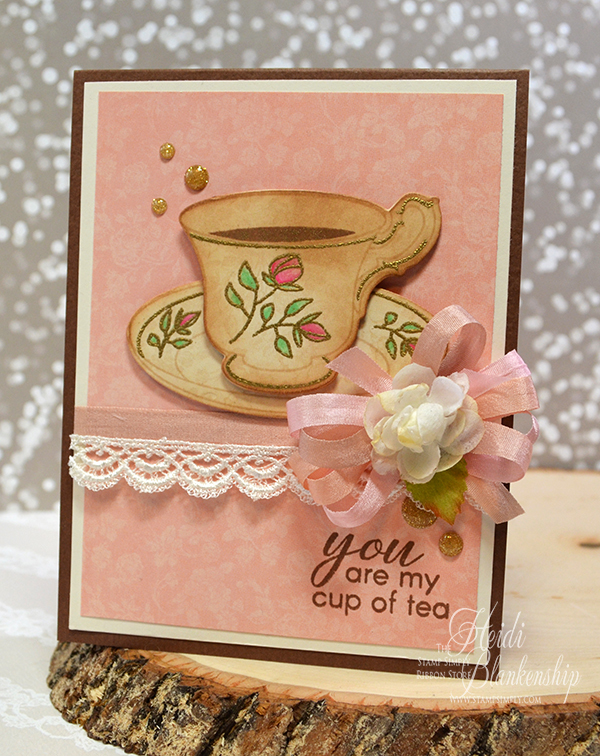 Next I used the Altenew - Vintage Teacup Die to die cut the images. I lightly inked the edges of the die cuts with Distress Ink - Vintage Photo. I added 3D Foam Squares to the backside of the die cuts to add some dimension and then adhered the pieces to the front of the card. For the background I used more of the beautiful Graphic 45 Mon Amour paper and then I added a layer of ivory cardstock. I added some Katarina Ivory Venise Lace and then some May Arts Pink/Champagne Gypsy Variegated Silk Ribbon with a bow. This ribbon is so pretty--I think it's going to be a new favorite. To finish off the card I added the card front to a brown A2 top folding card base. Then I added a few My Mind's Eye Charmed Enamel Dots and a Petaloo Botanica Collection - White Minis Flower to the center of the bow. I also stamped a sentiment in the bottom corner. Thank you so much for stopping by today! I hope you enjoyed the card share. 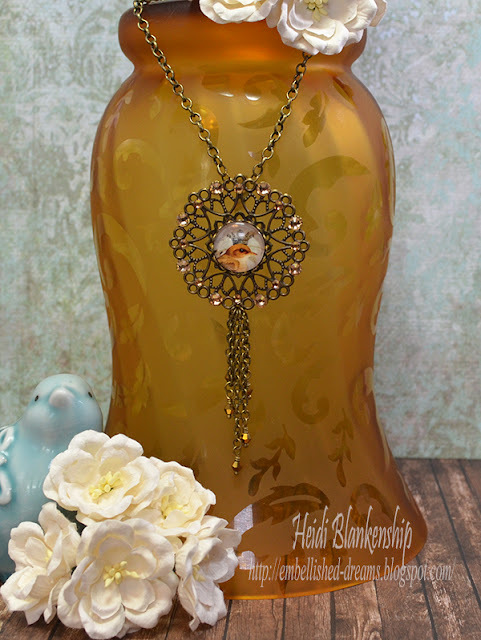 Please be sure to check out The Stamp Simply Ribbon Store for all of your paper crafting goodies. Also to see more inspiration check out the Stamp Simply Blog and the 2017 Spring Coffee Lovers Blog Hop. Hello and Happy St. Patrick's Day! The ground is still covered with snow here in Minnesota but according to the calendar the first day of Spring is this coming Monday, March 20th. I am ready for some warmer weather and spring colors but since it's not going to look like Spring outside I figured I'd bring some inside and create a pretty floral card. For my card I used a couple of the outline images from the Altenew - Painted Flowers clear stamp set. I stamped the images with VersaMark and heat embossed them using Ranger Super Fine White Embossing Powder, For the paper I used Ranger Watercolor. 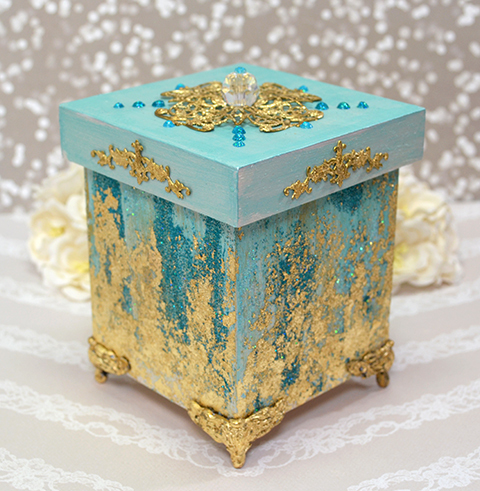 The watercolor was done with Tim Holtz Distress Inks. I didn't do any fancy watercolor it was just wet on wet and dropping color in. The wet on wet mean you wet the paper first with clean water and then add the watercolor. I started with the flowers and added Shaded Lilac first. Then I added in some Wilted Violet. On the first layer of Wilted Violet I used more water to tone the color down a little bit. Then I used a heat tool to dry the paper and added more of the Wilted Violet. I wasn't too worried about staying in the lines with the watercolor. For some images I like the look of the watercolor outside of the lines. I call it messy watercolor--now there is a technical term for you lol. After the paper was dry then I started adding color to the leaves. I used Cracked Pistachio for the leaves and for the first layer I used more water. Then I added a couple more layers of the Cracked Pistachio. Once I knew the paper was completely dry then I started to add clean water around the floral images at the top of the card and I added the water about an inch below the flowers. By adding the clean water this will help the color to flow in the background and I can blend the color out into the white area of the card. For the background I used Blueprint Sketch. I added a few layers of the Blueprint Sketch sketch and dried in between the layers. Then I turned the card around and repeated the same steps. For the last layer of color on both sides I let the paper air dry. Once the paper was dry I stamped the sentiment from the Words of Encouragement SS-017 Stamp Simply Clear Stamps with Memento - Tuxedo Black ink. Then I mixed some water with Black Soot ink and added some paint splatters. Next, I added some May Arts Violet Silk Ribbon with a bow and a Petaloo Botanica Collection Gray Minis flower to the center of the bow. I also added a few 5 mm Crystal Sequins for a little bit of sparkle. Then to finish the card I added Scrapbook Adhesives by 3L Foam Squares to the back of the watercolor panel and added that to a black A2 top folding card base. I hope you enjoyed today's card share! 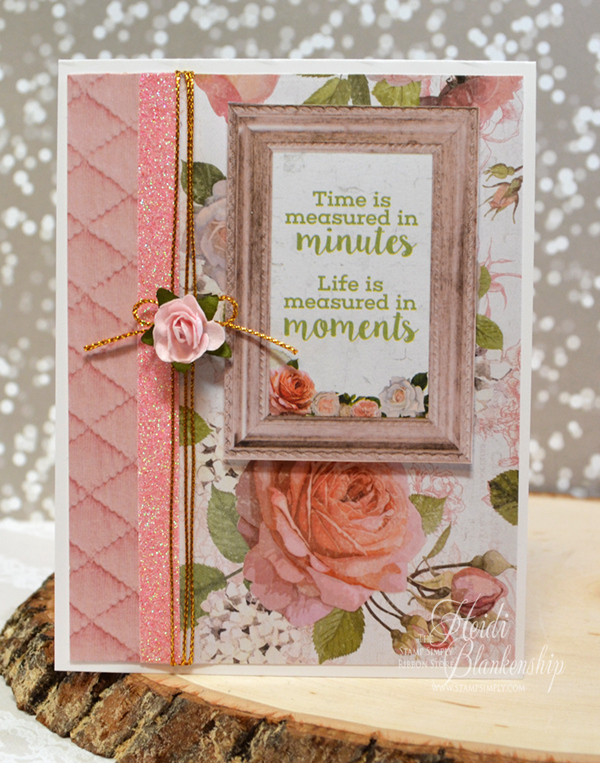 Please be sure to visit the Stamp Simply Blog to see more inspiration from the design team. Don't forget the check out The Stamp Simply Ribbon Store for all of your paper crafting goodies. Hello everyone! 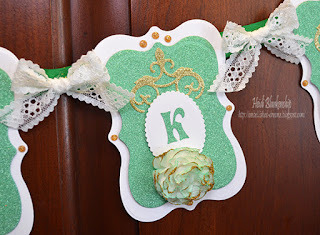 Today, I have a fun St. Patrick's Day project over on the Blog Tonic USA. Here is the LUCKY St. Patrick's Day banner that I made. Banners are a great project that can be made for any holiday. Here is a close up of one of the banner pieces. If you would like to see more pictures and fine out all of the details on how I put this banner together you can click HERE to visit the Blog Tonic USA. Hello everyone and happy Friday! Today, is my day to post for The Stamp Simply Ribbon Store. But before I get to my project I want to apologize for my post last Saturday. I am not sure what happened but I typed the post up a few different times and it just kept disappearing. I know some of you were able to see it because comments were left. So I thought I would just post a quick picture of the card and you can click HERE to see the post on the Stamp Simply Blog with the supply list. Ok, now for today's card share. I designed a CAS (Clean And Simple) card using the New Thinking of You Rose SS-015 and Words of Encouragement SS-017 Stamp Simply Clear Stamps. 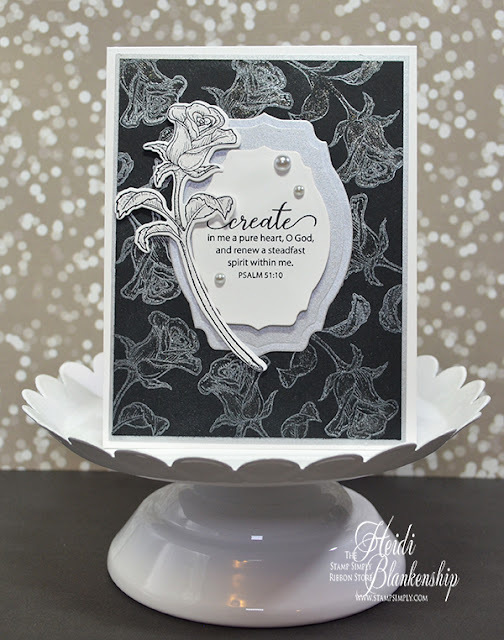 I started with a piece of black cardstock and I randomly stamped the image of the rose with Delicata White Shimmer ink. Then, I used a heat tool to dry the ink. Next, I used my finger to rub around each of the roses. A tiny bit of the shimmer from the ink will lift up and move around on the paper leaving a very soft shimmer in the background. 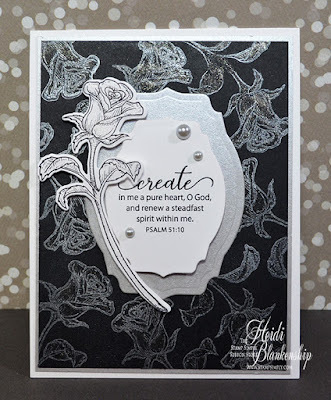 Next, I added some shimmer to the roses on the black cardstock using a Zig Wink of Stella Clear Glitter Brush Pen. I stamped the rose on to a piece of white cardstock using Tuxedo Black ink. Then, I used the Stamp Simply Steel Dies - Rose SS-DIE002 to die cut the rose. 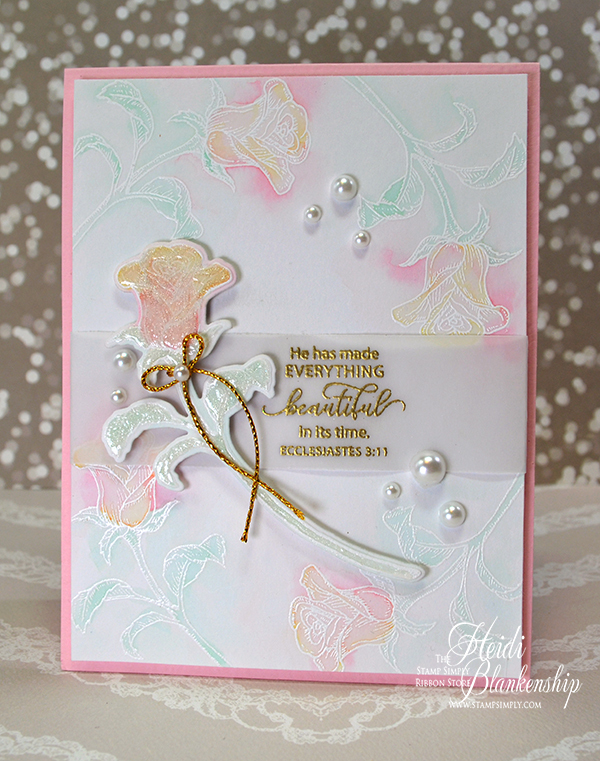 I also added Wink of Stella to the rose on the white cardstock. The sentiment is from the Words of Encouragement SS-017 stamp set. I used Tuxedo Black ink to stamp the sentiment on to a piece of white cardstock. Next, I used Spellbinders - Labels Thirty-Six to die cut the sentiment and another layer of cardstock. I used Luxury Pearlescent Metallic 105# for the second layer. 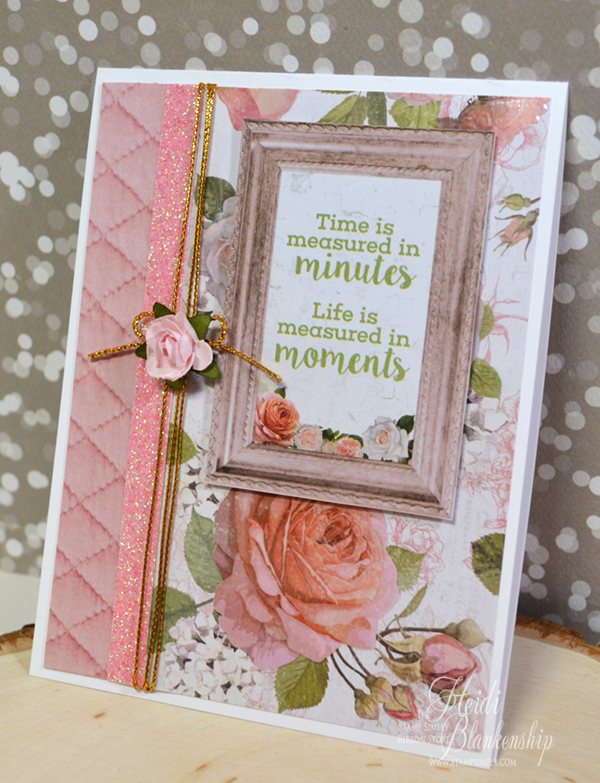 I added 3D Foam Squares to the back of the label with the sentiment and also to the rose die cut. 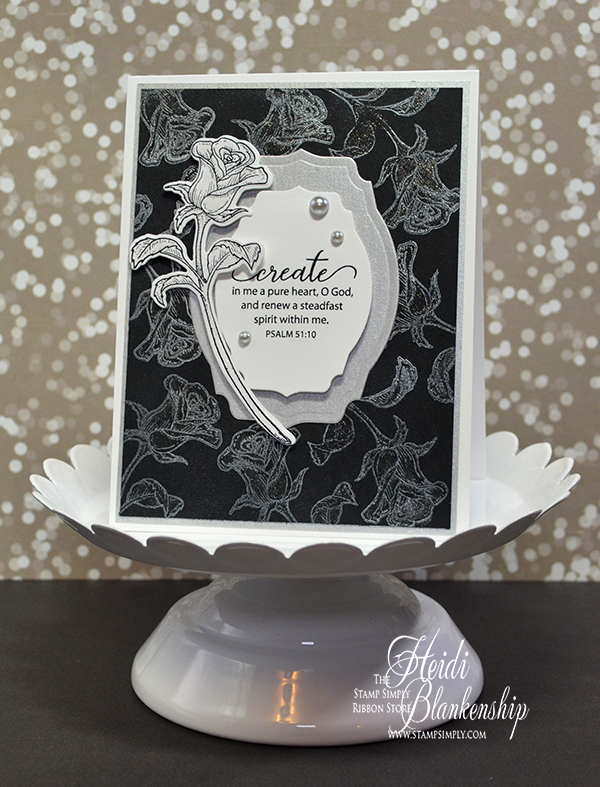 I added a layer of Luxury Pearlescent Metallic 105# behind the black cardstock and then I assembled the card. The card front was added to a white A2 top folding card base. To finish the card I added a few gray pearls. This was a very quick and easy card to make and you could use the same layout and switch out the sentiments for all different occasions. Please be sure to visit the Stamp Simply Blog for lots of inspiration from the design team. You can also visit The Stamp Simply Ribbon Store for all your paper crafting needs. Hello everyone! 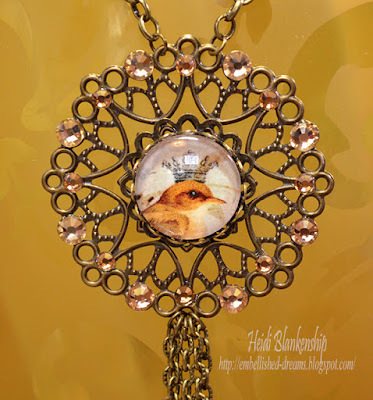 Today, I am guest designing for ButterBeeScraps and I have a jewelry project to share with you. 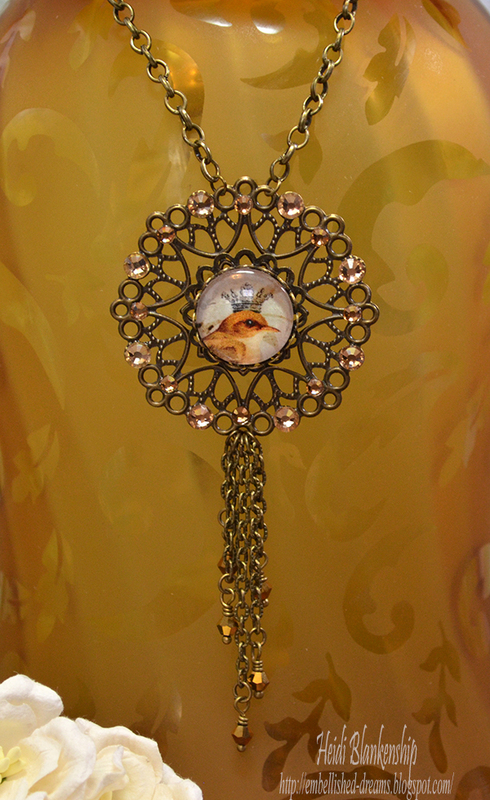 I designed this necklace using one of the beautiful Bronze Round Metal Filigree Embellishments 744-B. If you are new to jewelry making this is a very easy necklace to create. I used one of the Small Round Glass Cabochons CAB018 and glossy accents to adhere a pretty digital image from ArtCult that I printed out. Then, I glued the cabochon inside of the Small Bronze Round Cabochon Setting F018D-B. 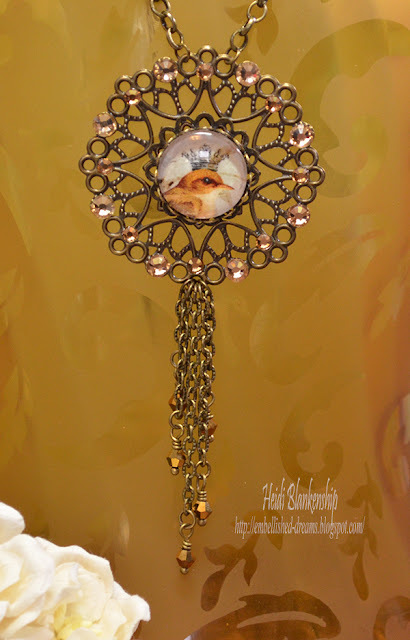 Next, I used E6000 to adhere the cabochon setting to the Bronze Round Metal Filigree Embellishments 744-B. 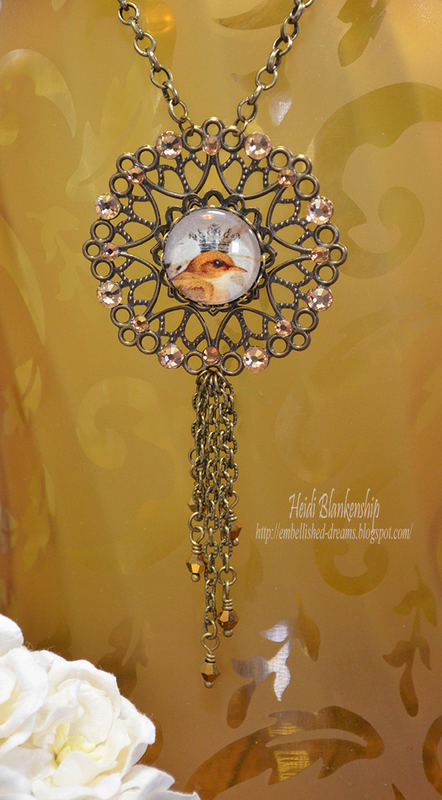 The cabochon setting fits perfectly in the center of the round metal filigree. I used glossy accents to adhere the SS20 Light Colorado Topaz Flat Back Glass Rhinestones and SS12 Light Colorado Topaz Flat Back Glass Rhinestones around the outside of the filigree. 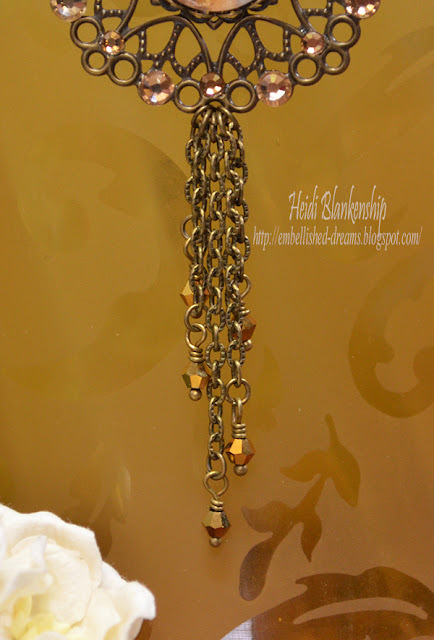 To create the tassel I used different lengths of Textured Bronze Cable Chain (#CH521-B) and with jump rings I added the pieces of chain to the bottom of the filigree. Then, I wire wrapped some tiny gold glass bicone beads and attached one on each of the bottom pieces of chain. To finish off the necklace I added more bronze chain and jump rings with a lobster clasp. If you like to create jewelry or work with metals I encourage you to check out ButterBeeScraps. Monique, owner of ButterBeeScraps has such a wonderful selection. Hello everyone and happy Friday! 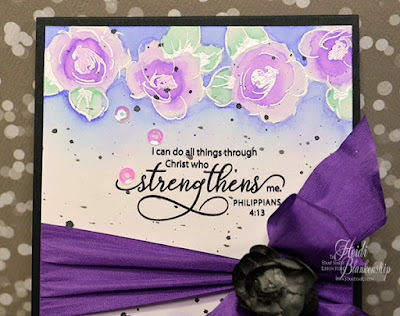 Today, all of the designers from The Stamp Simply Ribbon Store are participating in a Stamp Simply Spring Release Blog Hop. I'm excited to share one of the New Stamp Simply Spring Release Stamp Sets and a Coordinating Die Set. But before I get to my projects I want to share a video by Darsie Bruno. 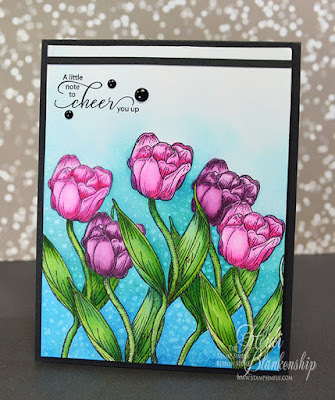 Darsie, has a wonderful video showing all of the New Stamp Sets and Die Sets. She also shares some beautiful projects she created with the new stamp sets and dies. So what do you think? I love all of the projects Darsie shared! 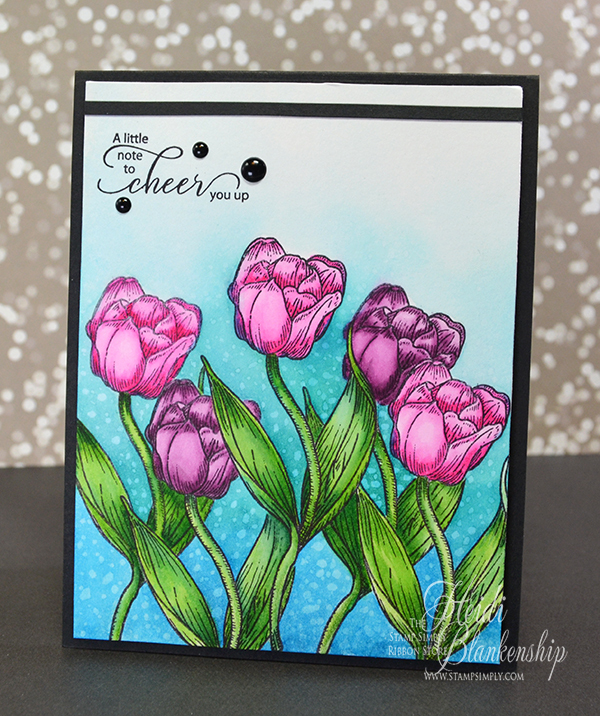 Especially the lavender rose card and the tulip box card--those two are my favorites. I love all of the new stamp sets! They are filled with so many wonderful sentiments and verses. Love the rose and tulips images too and the coordinating dies. I think its fantastic how all of the stamp sets mix and match too. Here is the card I designed using the New Thinking of You Rose SS-015 stamp set and the Rose SS-DIE002 coordinating die. I stamped all of the roses onto a piece of Ranger Watercolor paper using VersaMark Ink and then I heat embossed all of the image with Ranger Super Fine White Embossing Powder. I stamped and embossed another rose image on a separate piece of watercolor paper. I did a very light watercolor using Tim Holtz Distress Ink. For the rosebuds I used Worn Lipstick and Mustard Seed. For the stem and leaves I used Cracked Pistachio. I let some of the watercolor go outside of the embossing and then I add more water to have the colors fade out to white. I used the coordinating die to die cut the rose that was on the separate piece of paper. I stamped the sentiment on to a piece of Vellum using VersaMark Ink and then I heat embossed the sentiment using Ranger Super Fine Detail Gold Embossing Powder. I wrapped the vellum around the center of the watercolor piece and I taped it on the backside. Then, I added 3D Foam Squares to the die cut rose and added that to the card front. Next, I added a bow with some May Arts - Metallic Gold String and a few Melissa Frances White Pearls. 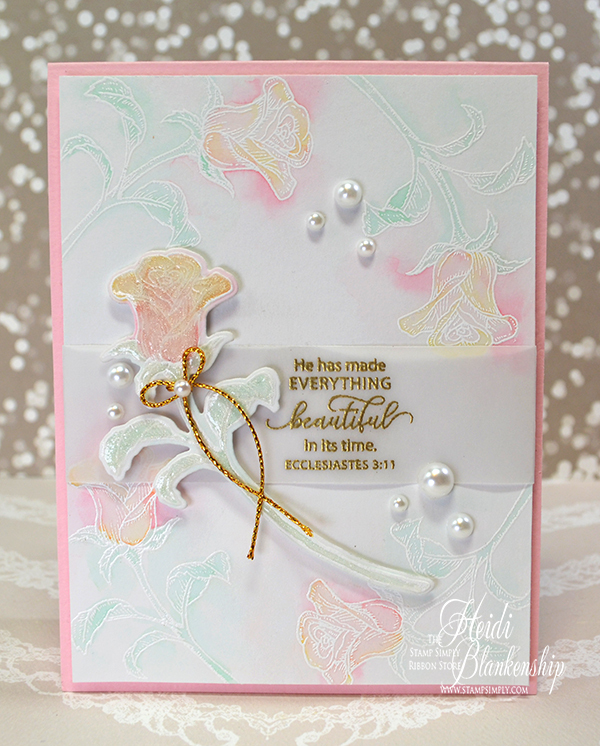 For a little added sparkle and shine I added Zig Wink of Stella Clear Glitter Brush Pen and Ranger Glossy Accents to the die cut rose. Here is a close up of the bottom half of the card. You can click on all of the images to enlarge them and see more detail. 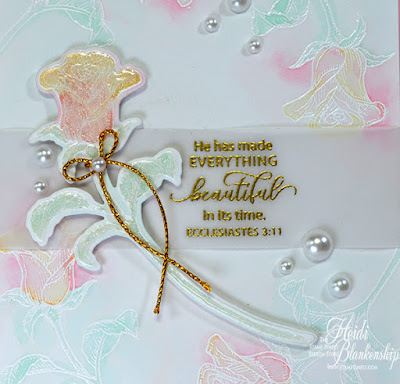 I added a white panel of paper on the inside of the card and I stamped the rose image with Spun Sugar Distress ink and then I heat embossed the sentiment in gold. To finish off the card I added the watercolor panel to a pink A2 top folding card base. 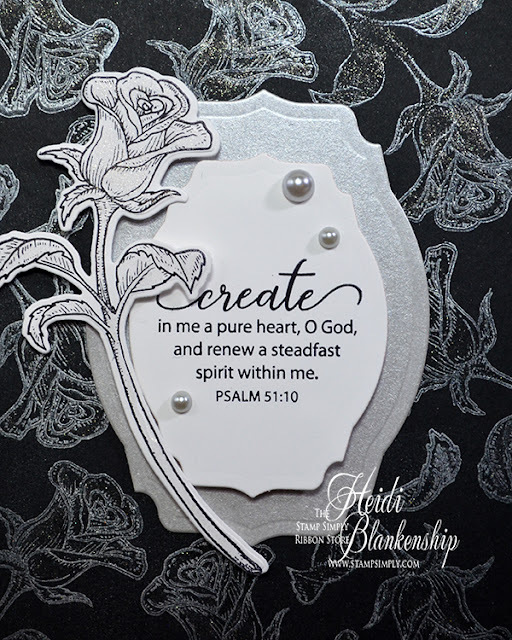 Please be sure to visit all of the blogs in the link list below for more inspiration and to see more projects made using the Stamp Simply Spring Releases. Thanks so much for stopping by today and I hope you enjoy the blog hop! Hello everyone! Today, I am excited to share one of my ICE Resin® projects with you. I love the look of Druzy stones and I have made several faux Druzy stones using a variety of German glass glitter, other types of glitter, tints, sand, and crushed pebbles. I was just playing around and mixed up some of the products when I found a new mixture for creating a faux Druzy and I absolutely love it! It has so much texture and sparkle to it so I thought Dazzling Druzy would be a fitting name. 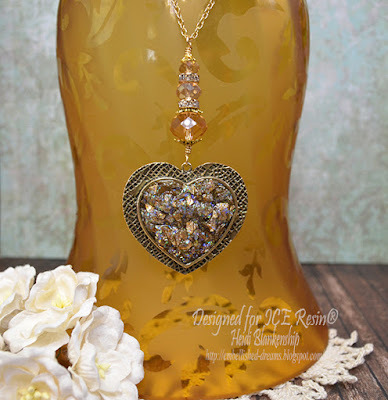 If you would like to learn more please visit the ICE Resin® blog where I share a step-by-step tutorial on how to create this beautiful necklace. 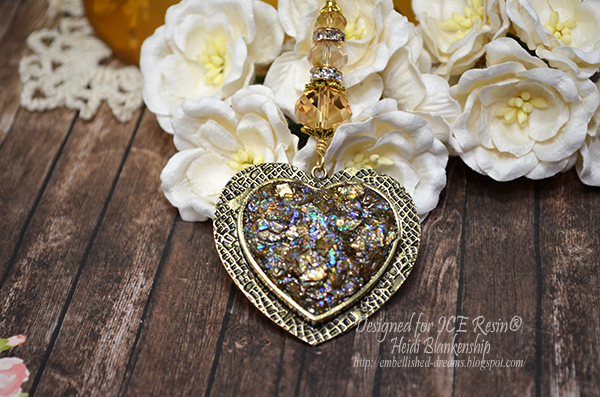 I would really appreciate it if you leave me a little love while you are there and let me know what you think about the Dazzling Druzy. If you are new to ICE Resin® I really encourage you to give this technique a try. It is very easy and beginner friendly. If you would like to find out more about this technique please visit the Tonic Studios USA Blog. I share the step-by-step instructions and also more photos.